Biocare’s PromARK micro-polymer detection systems are designed specifically for use on animal tissues. The micro-polymer technology provides superior sensitivity and minimum cross-reactivity to endogenous mouse and rat IgG. The Promark product line includes specially formulated heat-retrieval solutions, blocking agents, and one- and two-step detection reagents. 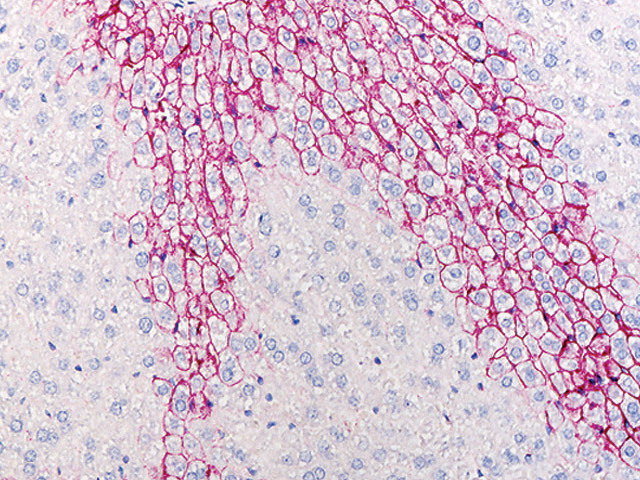 Animal tissues contain endogenous immunoglobulins that produce significantly high levels of background staining when standard anti-mouse/anti-rabbit detection systems are employed. Biocare provides micro-polymer detection systems for use with primary antibodies from various sources (mouse, rat, rabbit, goat) on a range of tissues (mouse, rat, canine, feline, bovine, equine, porcine, ovine) which result in reduced background staining and higher sensitivity. 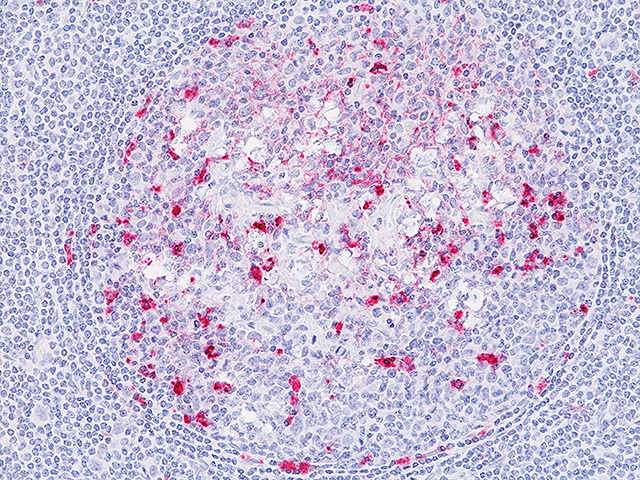 This novel detection technology allows for use of mouse primary antibodies on mouse tissues. Available as a bundle consisting of detection micro-polymer, blocking and HIER solution or available individual components. Use with mouse primary antibodies on rat tissues. Available as a bundle containing detection polymer, blocking and HIER solution or available individually. Use with rat monoclonal antibodies on mouse tissues. The Rat-on-Mouse HRP / AP micro-polymer detection is a two-step system. It is comprised of two reagents: a rat probe that binds to the rat primary antibody; and an HRP / AP micro-polymer that conjugates to the probe. Rabbit-on-Rodent detection is available as a micro-polymer only. Use with goat primary antibodies on mouse, rat and human tissues. The goat detection is a two-step system. This antigen retrieval buffer is specially formulated to work with Biocare’s Promark detection systems. Rodent Decloaker with proprietary blocking reagents help reduce mouse or rat endogenous IgG in rodent tissue. This is particularly useful for brain tissue; helps reduce nonspecific background staining and performs antigen retrieval. Antibody titers can be doubled or tripled when using Rodent Decloaker compared to the use of citrate buffer. This blocking reagent, designed for use exclusively with rat tissue, makes use of proprietary blocking agents to reduce and/or eliminate endogenous rat IgG. To be used with mouse-on-rat, rabbit-on-rodent and goat micro-polymer detection systems. This blocking reagent, designed for use exclusively with mouse tissue, makes use of proprietary blocking agents to reduce and/or eliminate endogenous mouse IgG. To be used with mouse-on-mouse, rat-on-mouse, rabbit-on-rodent and goat micro-polymer detection systems. 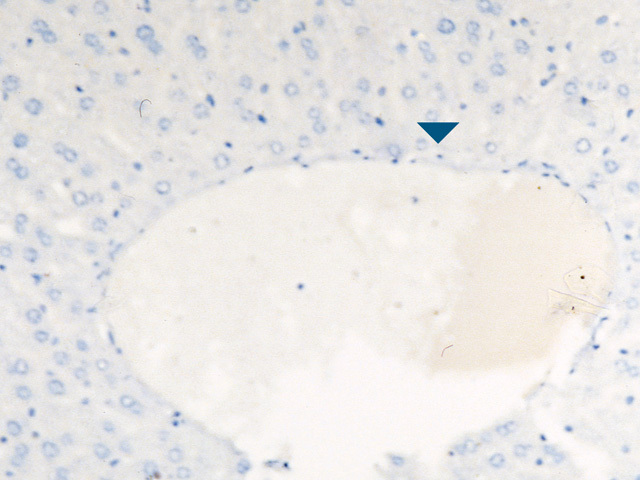 This blocking reagent is a potent blocker for eliminating endogenous rat IgG in rat tissues. The combination of Rodent Block R and XR Factor allows primary goat, rabbit and mouse antibodies to be used on rat tissues. XR Factor is formulated for use with mouse, rabbit, or goat micro-polymer detection systems, but should not be used with the rat micro-polymer detection system. This blocking reagent is a potent blocker for eliminating endogenous mouse IgG in mouse tissues. The combination of Rodent Block M and XM Factor allows primary goat, rabbit and mouse antibodies to be used on mouse tissues. XM Factor is formulated for use with rat, rabbit or goat micro-polymer detection reagents, but should not be used with any mouse micro-polymer detection systems. Biocare’s Rodent Decloaker, Rodent Block M and R, XR Factor and XM Factor can also be used with Biocare’s Fluorescent DyLight kits. Biocare DyLight fluorescent detection reagents may be used on mouse and rat tissues by adding 1-2 drops the XR or XM Factor to the fluorescent-secondary detection reagent. 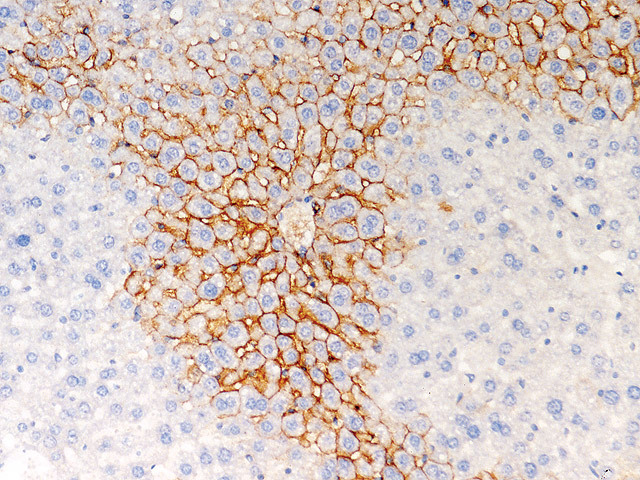 Use Rodent Block M and R prior to application of the primary antibody for optimal results. 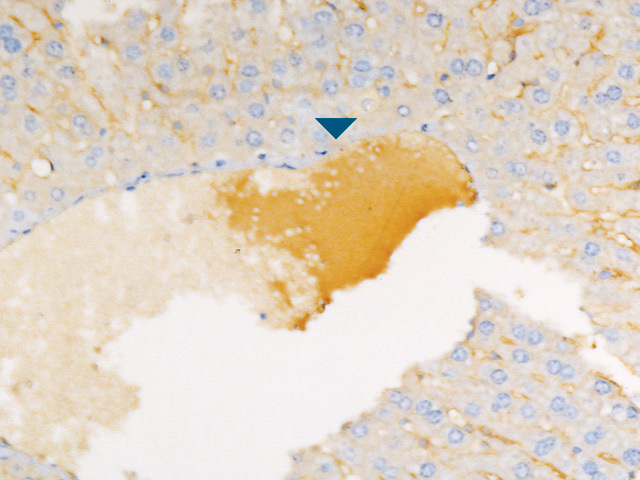 Arrows point out endogenous background due to staining of IgG. 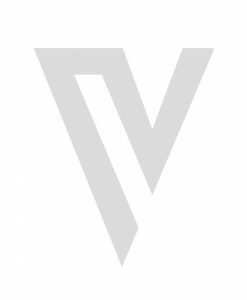 The Mouse-on-Canine and Rabbit-on-Canine detection polymers are specially designed for use on canine and feline tissues. 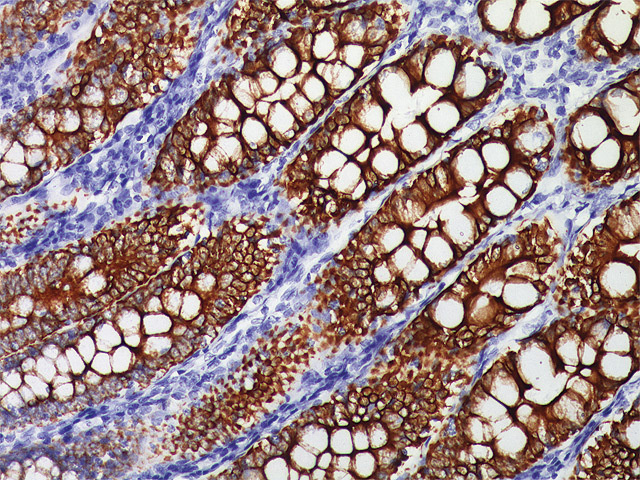 These additions to Biocare’s PromARK series expand IHC detection applications to a broader range of animal tissues, resulting in increased research capability. With advanced polymer technology and a proprietary potent blocker, the detection polymers provide increased sensitivity, reduced IHC steps (no Avidin/Biotin block or Link/Probe), and virtually eliminate cross-reactivity to endogenous canine and feline IgG. These kits can be used with paraffin-embedded tissues, floating sections and frozen sections. Canine detection is suitable for both manual and automated systems such as the intelliPATH™. 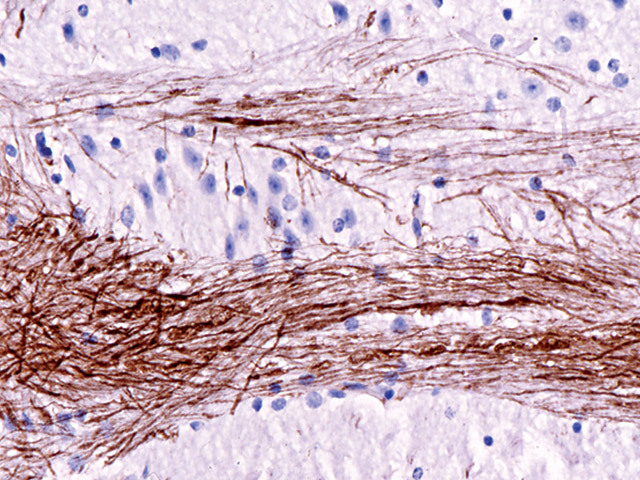 Prions, or more specifically- plaques of the PrPres protein, are the causative agents of Transmissible Spongiform Encephalopathies (TSE). The manifestation of prion infection in sheep is Scrapie. Scrapie is a fatal neurodegenerative disease that can have significant impact on the economic and physical viability of a sheep flock. In moose, elk, and deer, TSE is evidenced by Chronic Wasting Disease (CWD). 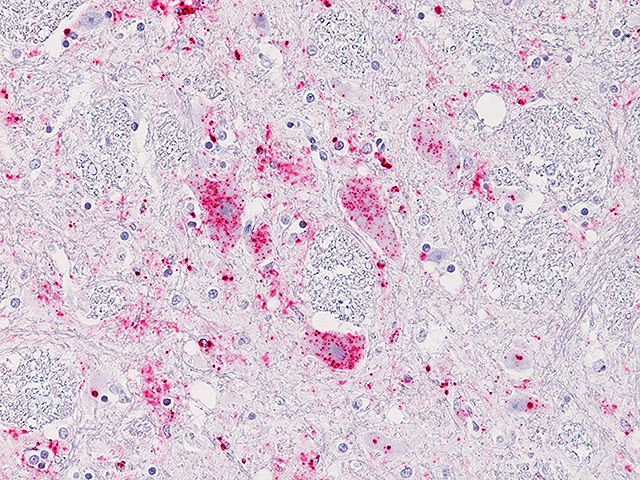 When a TSE infection is suspected in a sick or deceased animal, prion detection by IHC is the “gold standard” method for verifying that the illness was Scrapie or CWD. 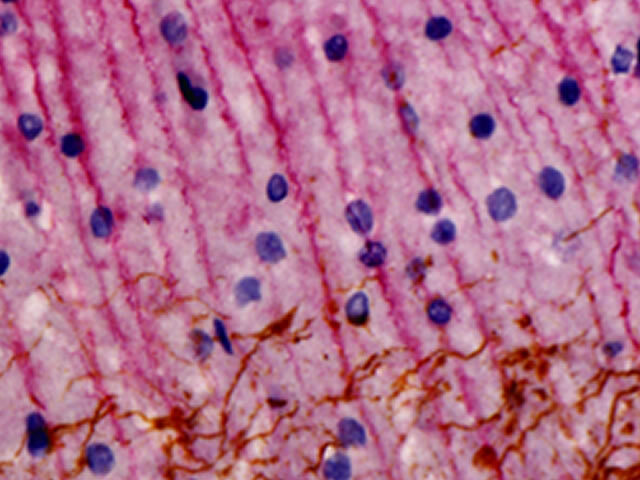 The Prion IHC Assay is part of a complete package of product offerings based on our established protocol for Scrapie and CWD detection. 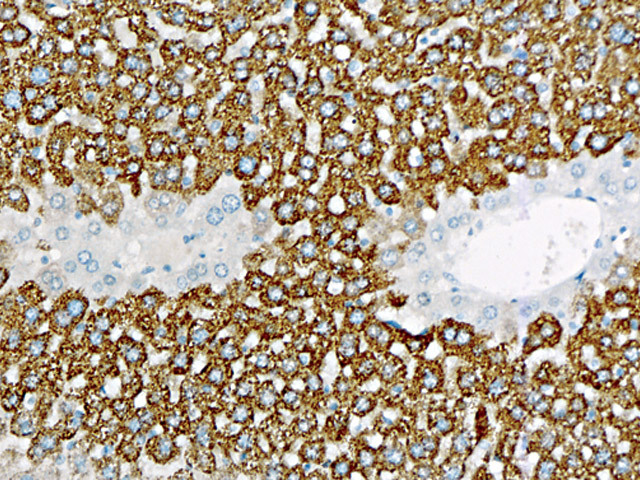 Biocare’s Prion IHC Assay features a streamlined kit format that contains blocking reagents, ready-to-use antibody, micro-polymer detection reagents and Warp Red chromogen. 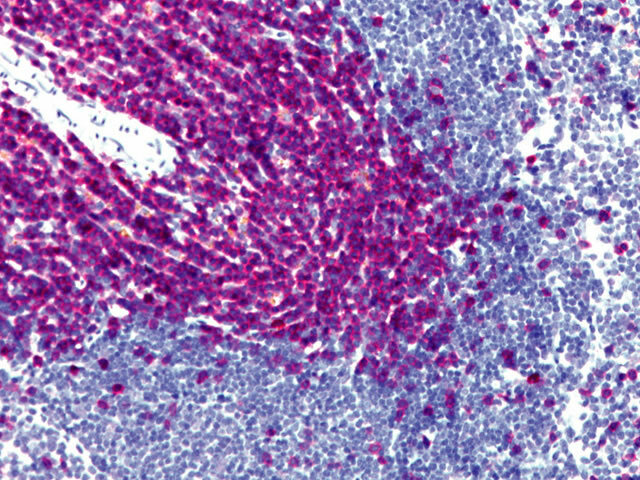 The Prion IHC assay is fully automated; all are reagents pre-packaged in intelliPATH vials for added simplicity and ease of use. 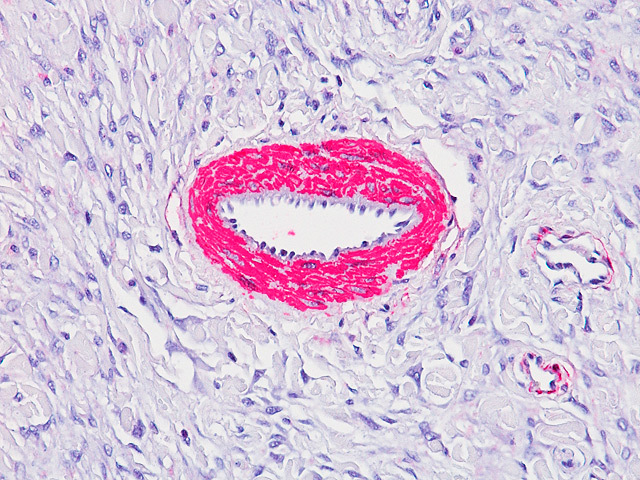 The Mouse-on-Farma and Rabbit-on-Farma animal IHC detection polymers bring high staining sensitivity and specificity to bovine, equine, porcine and ovine tissues. Combine together for universal and simultaneous double stains, enabling multiple antibodies in unique colors on a single slide. This can be completed in approximately the same time as a single antibody stain. This multiplex polymer detection is specifically designed for use on rat and mouse tissue. The 5-step procedure for detecting multiple antigens on a single slide can be done in approximately two hours using a simultaneous protocol. Staining time is reduced from 4-6 hours to approximately 2 hours by eliminating several steps: avidin-biotin blocking steps, elution step and sequential staining steps. The advanced micro-polymer technology provides simplified procedures, increased sensitivity and virtually eliminates background staining. Potent blockers such as Rodent Block M or Rodent Block R eliminate endogenous mouse or rat IgG background for the most difficult of tissues including: lymph, spleen, lung, kidney and liver. The Mouse-on-Canine HRP-Polymer may be combined in equal volumes with the Rabbit-on-Canine HRP-Polymer to prepare a universal HRP-Polymer detection that will label both mouse and rabbit antibodies with HRP. The Mouse-on-Canine HRP-Polymer may be combined in equal volumes with the Rabbit-on-Canine AP-Polymer to prepare a double stain polymer detection that will label the mouse antibody with HRP and the rabbit antibody with AP. 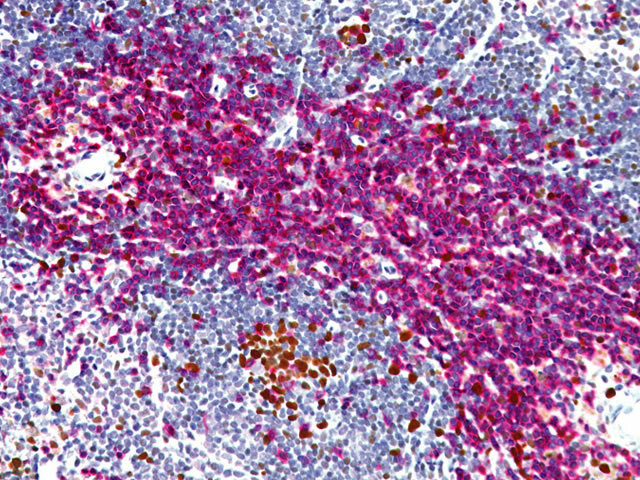 The Rabbit-on-Canine HRP-Polymer may be combined in equal volumes with the Mouse-on-Canine AP-Polymer to prepare a double stain polymer detection that will label the rabbit antibody with HRP and the mouse antibody with AP. The Mouse-on-Farma HRP-Polymer may be combined in equal volumes with the Rabbit-on-Farma HRP-Polymer to prepare a universal HRP-Polymer detection that will label both mouse and rabbit antibodies with HRP. The Mouse-on-Farma HRP-Polymer may be combined in equal volumes with the Rabbit-on-Farma AP-Polymer to prepare a double stain polymer detection that will label the mouse antibody with HRP and the rabbit antibody with AP. The Rabbit-on-Farma HRP-Polymer may be combined in equal volumes with the Mouse-on-Farma AP-Polymer to prepare a double stain polymer detection that will label the rabbit antibody with HRP and the mouse antibody with AP. 1. A blank spot indicates only that testing has not yet been done. The antibody may or may not work on that tissue type. 2. This list is being constantly updated with additional antibodies tested based on tissue availability. 3. The optimum antibody dilution and protocols for a specific application can vary due to many factors. These include, but are not limited to: tissue perfusion, fixation, incubation times, section thickness and detection used. 4. The data sheet recommendations and protocols are based on exclusive use of Biocare products. Due to the superior sensitivity of these unique reagents, the recommended incubation times and titers listed are not applicable to other detection systems, as results may vary. Ultimately, it is the responsibility of the investigator to determine optimal conditions. 1. In general, using Biocare’s Reveal Decloaker and Decloaking chamber at 95ºC for 40 minutes gives excellent results in canine/feline tissues. Refer also to the individual antibody protocols as provided on their datasheet. 2. If a concentrate is used, please consult the antibody datasheet for recommended diluent ratio and time. 3. Biocare’s predilute antibodies are generally incubated for 30-60 minutes or diluted and incubated overnight. 4. Canine and farma detection may be applied on tissue for 30-60 minutes. A good initial protocol is a 60 minute primary antibody incubation followed by a TBS buffer wash and a 30 minute detection incubation. 5. If background staining is noted in tissues, Background Punisher may be applied after the primary antibody for 10 minutes. Recommended chromogen protocols are Betazoid DAB (HRP) for 5 minutes or Warp Red (AP) for 7 minutes. 6. Double Stain Protocol: A mouse polymer and a rabbit polymer may be combined and incubated for approximately 60 minutes (Mouse HRP & Rabbit AP or Rabbit HRP & Mouse AP). A Background Punisher application for 10 minutes is recommended after the primary antibody for double staining procedures.